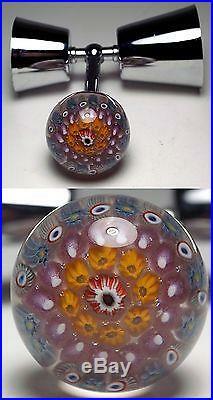 COMPLETE LASSMAN VASART MILLEFIORI PAPERWEIGHT HANDLED BARSET with POOR CONDITION CASE. 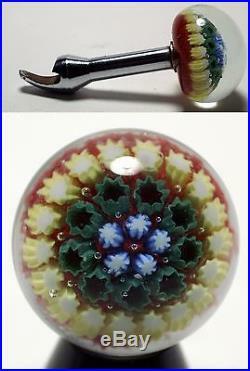 Vasart / Lassman Millefiori Paperweight Bar Set. The firm of Lassman & Co designed and produced this bar set during the 1950s and 1960s. 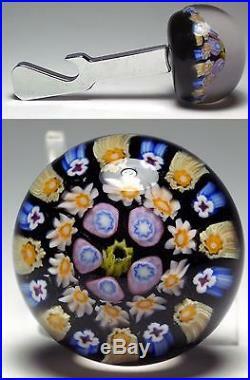 The millefiori paperweight handles were made by the Ysart family of Scotland under the Vasart label. 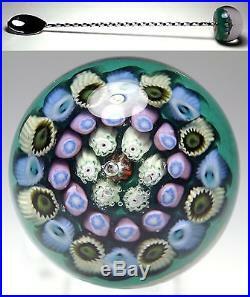 The millefiori paperweight handles each have a concentric design that matches the setup and canes of other Vasart paperweights. 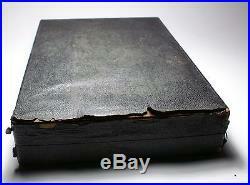 Note: The case is in very poor condition. 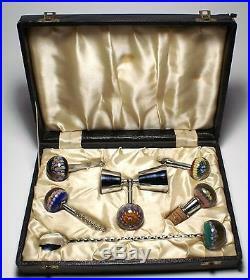 This set is priced only slightly above the price of the individual pieces. The maker of this item was Lassman & Co. Located in the Kilburn area of North London. Pirelli obtained them from Vasart. Pirelli also included the line in their 1959 catalog. There are very few complete sets known to exist with the case. A smaller set is shown on page 157 of the book on Ysart Glass published by Volo (the section on Vasart was written by Frank Andrews). There is also a display of another smaller set in the museum in Perth which attributes this to Vasart Art Glass. For more information, see the article by Angela Bowey and Allan Port Pirelli, Vasart and the Ysart Family in the Paperweight Collectors Association Inc. For more information, see my web page on Lassman & Co. The six piece set is complete with the original “leatherette” carrying case. It includes the following pieces. Paperweight Handled Claret Spoon (or Martini Stirrer) (10 1/4″ long x 1 9/16″ diameter) Unmarked. Paperweight Handled Double Jigger Measure (marked 1 ounce and 1 1/2 ounce) (3 7/8″ wide by 3 3/8″ long – handle is 1 1/2 diameter) The cups are marked 1 oz. And 1 1/2 oz. And MADE IN ENGLAND. Paperweight Handled Corkscrew (4 1/4″ long by 1 1/2″ diameter) Marked ENGLAND – Thread has minor damage – Handle has some pinpricks on side. 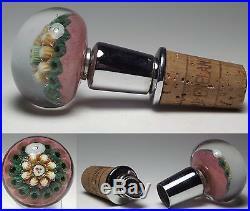 Paperweight Handled Two Piece pourer (3 1/2″ long by 1 1/2″ diameter) Cork is marked MADE IN ENGLAND – Small scratch on the side and wear on the cork. Paperweight Handled Bottle Opener (3 7/8″ long by 1 5/8″ diameter) Unmarked. Paperweight Handled Can Opener (3 5/8″ long by 1 1/2″ diameter) Marked ENGLAND. If you need more pictures, do not hesitate to ask and I will send them to you. Case Size: 12″ long by 8 1/2″ wide by 2 1/4 deep. Condition: The case is in very poor condition. 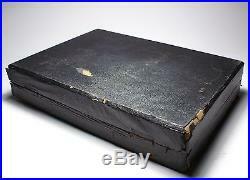 The case is losing its cover and the inside lining has some stains (both on the back and below some of the pieces). The case also has tarnished / pitted brass hardware. Some of the bar pieces show signs of wear and use. The worst of the defects is the can opener which has some chrome and metal loss at the tip and the corkscrew has a defect on the thread. Signature: The word “ENGLAND” appears on the metal part of the can opener and corkscrew. Each cup of the Double Jigger Measure and the the cork of the Two Piece Pourer are marked “MADE IN ENGLAND”. The bottle opener, spoon, and case are unmarked. Allan’s Paperweights is owned by Allan Port. For a complete list of great references on paperweights and some fun information on paperweights, please check out Allan’s Paperweights. There are fun quizzes about paperweights, reports from Brimfield, a peek at my collection, and more. This item is a US only listing. Check with me first if in doubt. Please do not ask me to declare this a gift. The item “COMPLETE LASSMAN VASART MILLEFIORI PAPERWEIGHT HANDLED BARSET with POOR CASE” is in sale since Sunday, May 28, 2017. This item is in the category “Pottery & Glass\Glass\Art Glass\Paperweights\Vintage”. 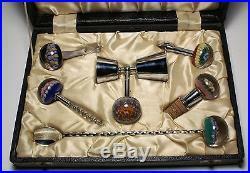 The seller is “paperweights” and is located in New England. This item can be shipped to United States.